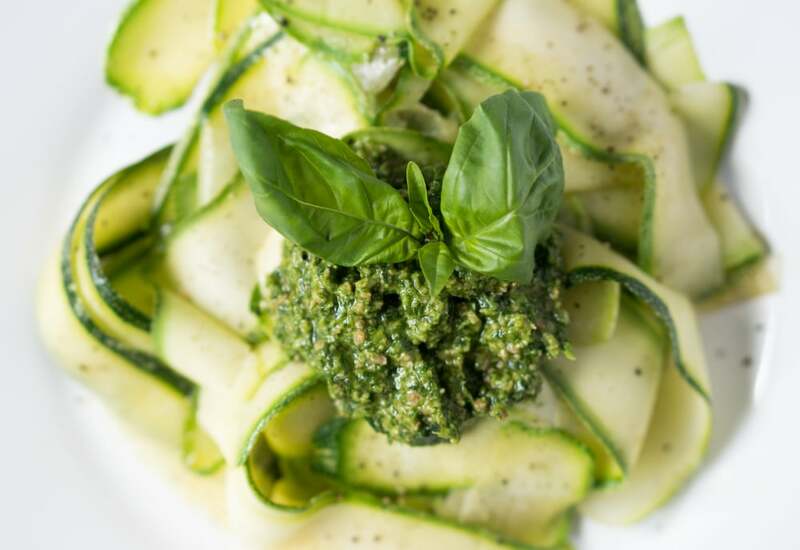 Lightly sautéed SpiraSliced zucchini is paired with a fantastic minty pesto in this recipe to make one killer low-carb pasta. Per Serving: 287 calories; 25g fat; 14.2g carbohydrates; 8g protein; 5mg cholesterol; 275mg sodium. It's hard to get a non-veg/ non- gluten intolerant person on board with zoodles but this creamy pesto with mint changed my husband's mind. Any chance he sees pesto on a menu, he orders it (whatever it is), but he'd never had it with mint and loved it! Zucchini and mint is a combo I've just discovered, thanks to recipes on this site, and I am in LOVE. Lightly sauteeing the zoodles just warms them through and the pesto adds a really nice flavor. I might try drying out the zoodles before sauteeing them, or just using the zoodles raw for the next round. Excellent! Love the mint pesto, and made a double batch to store and serve with other dishes! I am a fan of warm zoodles so like that this called for sauteeing.